Officials from Canada Wednesday afternoon announced their opposition to listing chrysotile asbestos as a hazardous material, smothering the chance to reach a highly-sought consensus at the Rotterdam Convention this week. Canada’s opposition came on the same day that India and Ukraine announced their change of position, and Sudan clarified its stance, all to support putting asbestos on the list. Under the Convention’s current rules of procedure, the chemical may not be put on the Annex 3 list unless all countries at the Convention agree, according to Michael Stanley-Jones, spokesperson for the United Nation’s Environment Program. The Canadian stance touched off considerable backlash, both within the country and abroad. Stanley-Jones did say that the Candidate Chemical Group is exploring ways to change the rules of procedure to relax the current requirement that mandates unanimous agreement for listing a chemical. He also said that Canada’s announcement was not yet part of the official proceedings, leaving it room for negotiations on Thursday. Exposure to asbestos is proved to cause mesothelioma, a cancer that effects the lining of the lungs, abdomen and heart. An estimated 3,000 cases each year are diagnosed in the United States. Canada is one of the world’s last remaining producers of asbestos, an operation that still employs several hundred workers in Quebec. The use of asbestos is restricted throughout Canada, and 90 percent of the product mined there is exported. Even though health organizations in Canada have called for the end to asbestos mining, the current government has not agreed. Earlier in the day, after India and Sudan had clarified their positions, Karel Blaha, co-chair of the Chemicals Contact Group and a representative for the Czech Republic, said he hoped to soon report soon a consensus had been reached. Past efforts to put asbestos on the Prior Informed Consent (PIC) list  which would strongly discourage the exporting and importing of the material  have failed because of determined opposition from a few countries. Canada has helped thwart previous efforts. 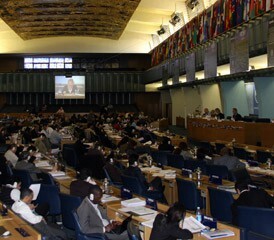 Vietnam, Kazakhstan and Kyrgyzstan were the other countries that Tuesday opposed putting asbestos on the list. Sudan’s earlier opposition came from a mistranslation from Arabic to English. Reinstein said Tuesday she was bothered by the inability of the delegates to reach a consensus, despite continued support from the medical and scientific community to do so. On Wednesday, she praised the country of India for changing its stance.